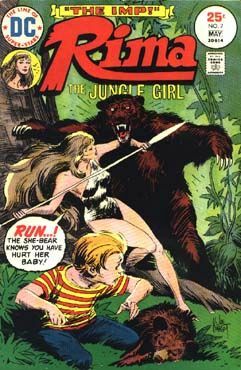 Joe Kubert cover, In "The Imp," Rima and Abel must each deal with trouble caused by a boy and his mother traveling with a safari. Story credits: unknown. Art by Nester Redondo. Issue also has a one-page text feature "Jungle White Men: Fact or Fiction" and "Space Marshal." Script by Robert Kanigher and art by Noly Zamora. Last issue of series. Cover price $0.20.